The residential lease with an option to purchase agreement gives a tenant the right to purchase the property in accordance with the terms set in the agreement. 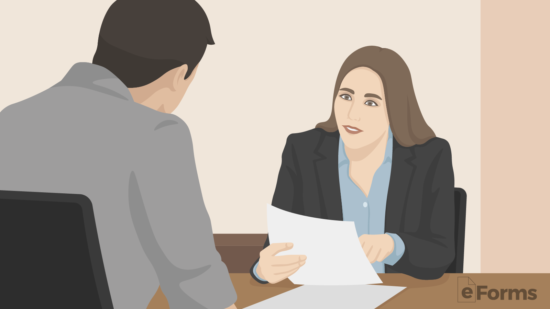 The form must be written in accordance with all State landlord-tenant lease laws in addition to following the State’s real estate commission’s rules which typically require certain disclosures forms to be attached. 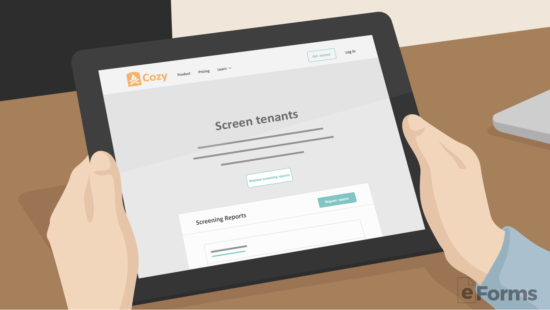 Rental Application – Use to verify a tenant’s background including criminal, credit, and employment history. 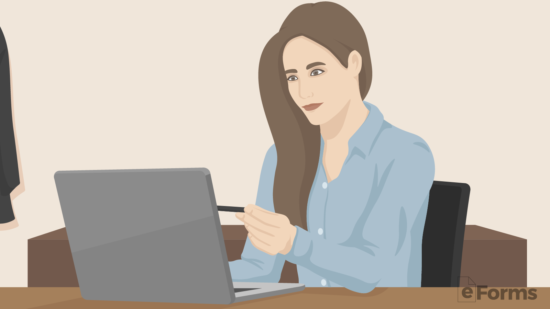 How Does a Lease with an Option to Buy Work? Remember that this agreement is a standard residential lease agreement with an option to purchase the property during a period of the term. The buyer is not bound to purchasing the property. Although, if the buyer chooses to buy the property, the seller will be obligated to sell under the terms of the agreement. Once the above terms are agreed upon the main items of the rental portion are complete. The language of the lease-purchase will usually just have these terms with the condition of both parties entering in “good faith” to a purchase agreement. 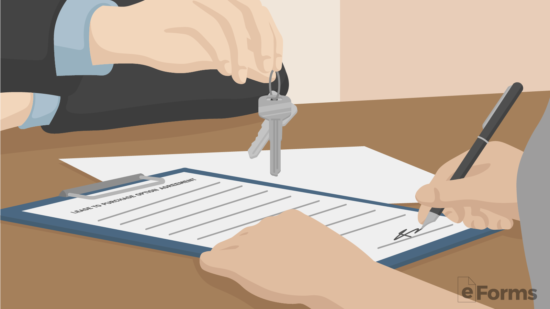 Like any other lease agreement, the landlord is recommended to give the tenant a rental application in order to obtain their personal information to perform a credit, background, and criminal check. U.S. National Directory – Use to perform a nationwide check of an individual or geographical area. Pay Stub – Past 2 weeks. After conducting the aforementioned checks on the tenant the landlord should have an idea of whether to accept or deny the individual. If the landlord accepts the tenant, the parties should agree to meet. Mail Access – If there is a mailbox on the property. Other Fees – If there are any other obligations due (e.g. pet fees). The tenant may now move-in to the property. They will be responsible for moving in on the correct day and time in accordance with the property’s rules. 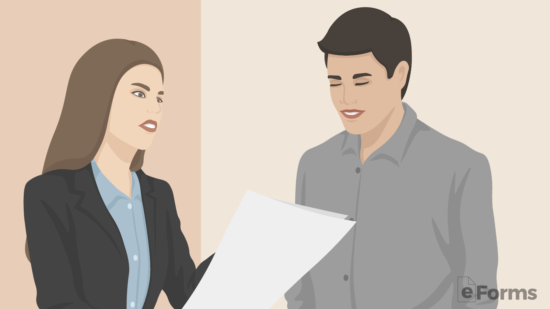 If the tenant sees anyone else on the premises they should make sure to introduce themselves and get familiar with their neighbors. If most option to purchase lease agreements, there is usually an earnest money deposit that is required. At this time the landlord should be informed of the tenant’s intent to buy the property either directly or through the landlord’s agent. Financing Contingency – Is the purchase of the property contingent on the tenant receiving financing? Inspection Periods – Usually the buyer will have the right to inspect the premises by a certain date. Negotiate Defects – If there are any defects found in the residence the items will need to be negotiated by the parties. Perform a Survey – Ensure that the property lines are where the owner claims to be. In addition, it would help the buyer to obtain any tax maps from the local or county assessor’s office. Closing Date – This is the last day the buyer has to perform the transaction with the seller. After this date the seller will be entitled to keep the earnest money. Every State has their own required disclosure forms. In order to perform a “good faith” transaction, it’s important for the seller to inform the buyer of any repairs needed, defects, or any other problems with the property. Often times if the buyer find out about a material defect after it has been inspected it may give them a bad taste in their mouth and wonder if there is anything else wrong with the property. Lead-Based Paint Disclosure – Required to be attached to the agreement if the property was constructed before 1978. At the closing, the buyer will be responsible for making sure the funds are available. This is typically through a wire transfer that occurs before or at the closing with the title company verifying the funds are present. 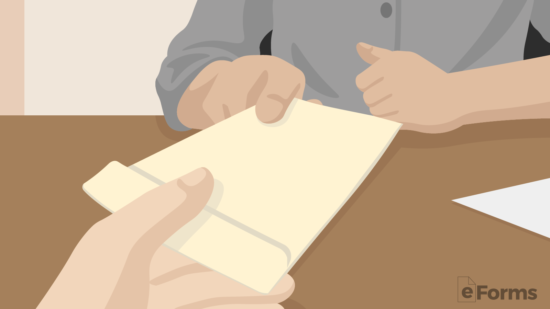 Afterward, the funds will be transferred to the seller and the buyer will have the deed signed over to them. Once the closing is complete, the buyer will take the newly signed deed to their county recorder’s office. There will be a transfer fee required, this is split between the buyer and seller, and once recorded the property will be in the possession of the buyer. This contract template should be downloaded in one of the formats available. Select your preferred format clicking on the PDF (Adobe PDF), Word (Microsoft Word (.docx)) or ODT (Open Document Text (.odt)) buttons captioning the preview image. The opening paragraph will deliver the wording to solidify its Date and the Parties involved. Use the first blank space to document the Month, Calendar Day, and Year of this agreement. The second blank line will need to have the Full Name of the “Seller/Landlord” presented. This is the Property Owner. 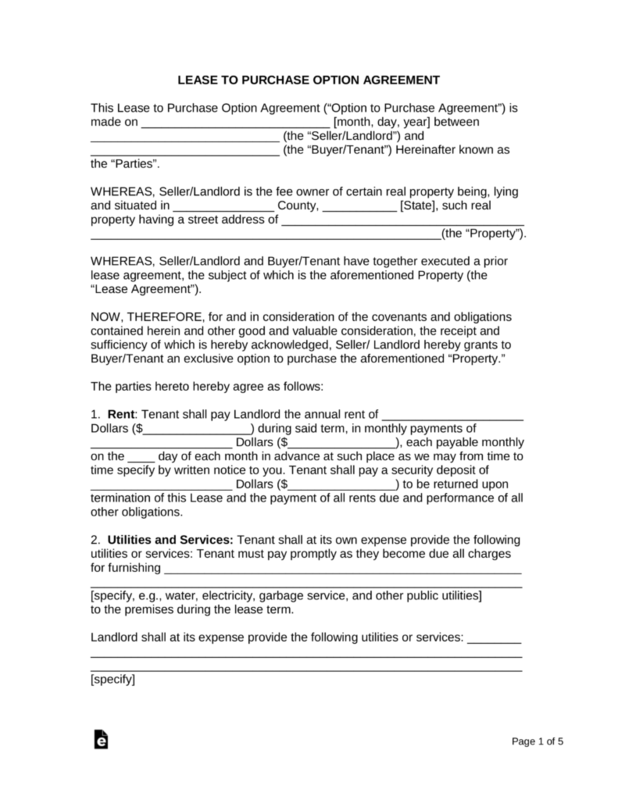 The blank line labeled “(The “Buyer/Tenant”)” should have the Full Name of the individual who wishes to lease and potentially purchase the Property by satisfying this document’s requirements. We will use the spaces provided in the second paragraph to present the Property the Seller/Landlord will lease, and perhaps sell, to the Buyer/Tenant. Begin by supplying the County and the State where this Property can be found and physically accessed on the first two blank spaces. The empty line after the phrase “Such Real Property Having A Street Address Of” must be furnished with the Building Number, Street Name, and (if applicable) Unite Number. Several articles will be used to define the nature and details of the agreement. Once this agreement is signed properly, each party will be expected to adhere to the terms placed on him or her. Some of these articles will require information that is unique to the participants and the property to be supplied to them, so they may be applied properly. Locate the first item, “1. Rent,” then proceed to write in the total amount of money the Landlord expects the Tenant to pay during the year on the first empty line. Follow this by entering this Yearly Rent Amount numerically on the second blank line. Now we will solidify the Monthly Rent Amount the Tenant must pay the Landlord during the course of this lease. Write out how much money the Tenant must pay each month to the Landlord on the blank space that follows the phrasing “In Monthly Payments Of.” Make sure to supply the Monthly Rent Amount numerically on the blank line after the dollar sign. In addition to the Monthly Rent Amount, document the Calendar Day of the Month when the Landlord expects the Monthly Rent Payment from the Tenant. Typically, this is the 1st of the Month. The last piece of information required in the first article is the Security Deposit Amount. Complete the statement “Tenant Shall Pay A Security Deposit Of” with the written and numerical Dollar Amount the Buyer/Tenant must submit to the Seller/Landlord to lease the Property. Note: How much this Amount may be is regulated by some states, make sure the Security Deposit Amount is within its legal limit. In the second article “2. Utilities ANd Services,” the matter of the Utilities and Services required by the Property will be discussed. Here we will discuss which of these parties will be responsible for providing and paying for which Utilities and Services. This will be accomplished in two areas. Fill in each Utility and/or Service the Tenant will pay for and maintain during this lease on the blank lines after the words “Tenant Must Pay Promptly As They Become Due All Changes For Furnishing.” An example of such Utilities/Services would include Gas, Electricity, Cable, Landscaping, Pool Maintenance, etc. 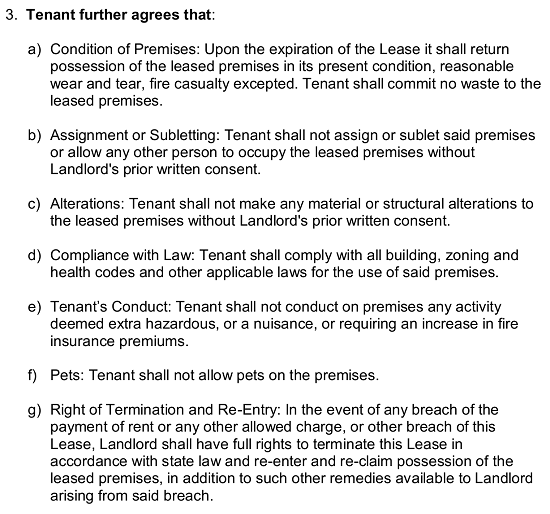 Similarly, in the space provided after the words “Landlord Shall At Its Expense Provide The Following Utilities Or Services,” list each Utility or Service the Seller/Landlord will arrange and pay for during the lifespan of this agreement. The third article, “3. Tenant Further Agrees That,” will supply some additional obligations for the Tenant to uphold when he or she signs this document. Both parties should read and become familiar with this section. The court system that will rule over the terms and execution of this paperwork must be disclosed in “17. Governing Law And Venue.” Enter the County and State where this agreement is governed and (if necessary) enforced on the blank line labeled “County” and “State” accordingly. Each member involved with this agreement must verify their acknowledgment and compliance with its terms. This will be handled in the area provided in the last area of the last page. The Seller/Landlord must find the blank lines labeled “Seller/Landlord’s Signature” and “Print” then, sign and print his or her Name. Two such signature areas have been included in case there is more than one Seller/Landlord is involved. 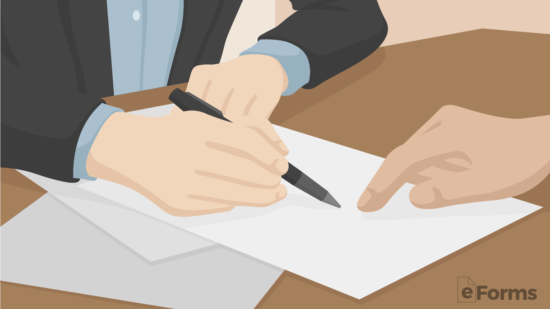 Each Seller/Landlord involved must sign this document so if there is a third make sure an attachment with these signatures is provided or you may add more space with an editing program. Each Buyer/Tenant must sign and print his or her Name on the blank lines bearing the labels “Buyer/Tenant’s Signature” and “Print.” As with the Seller/Landlord, each Buyer/Tenant involved must satisfy this signature area so enough room for two has been provided however, if there are more make sure these additional parties also satisfy the Signature requirement either by including an attachment or by adding more space. 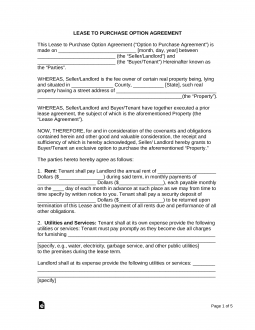 The Agent(s) working with these parties and arranging this Lease/Purchase should also satisfy the signature area using the blank lines labeled “Agent’s Signature” and “Print.” If more than one Agent is involved, make sure each one signs this paperwork as well. Finally, the individual witnessing this signing should sign and print his or her Name on the empty lines labeled “Witness’s Signature” and “Print” (respectively).